The first thing I love about this place is its name. It means “Beyond expectations” which is a big claim (well, depending on how much you’re expecting I guess, it my case that’s usually a lot). And it’s also particularly hard to pronounce for English speakers (until you’ve got the hang of it) – all those syllables make for a real tongue twister and some hilarity at times. The estate goes way back. It originally formed part of the Constantia Estate which was founded by Simon van der Stel, who was the first Governor of what was then a Dutch colony in 1679. The first vines (90,000 of them) were planted here in 1825 by Ryk Arnold’s Cloete. The farm was more recently restored to its former glory by current owners, the Muellers. The restaurant is in the original thatch-covered and white-washed Cape Dutch building with a large inside area and welcoming veranda overlooking the courtyard. Love a courtyard. Chef Edgar Osojnik hails from Austria and serves up hearty retro-style dishes. So what can you expect? Well, it’s an interesting menu with lots of classic dishes and some more unusual offerings. And the classics have some added extras too. 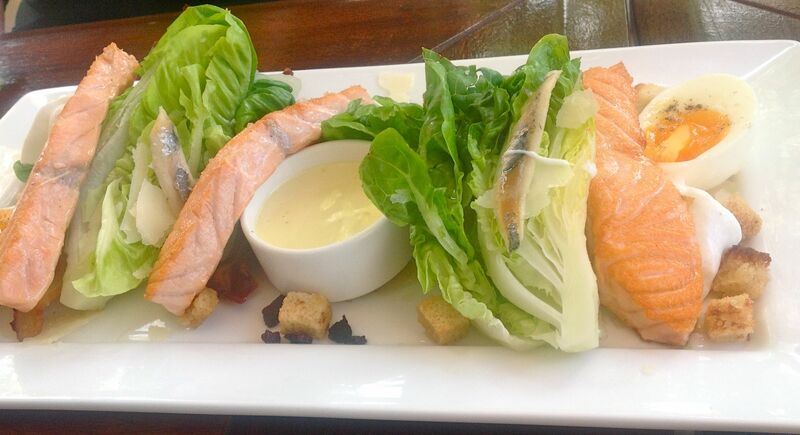 Like Edgar’s Caesar salad which is served with a generous portion of Norwegian salmon. The dish, like quite a few on the menu is available as a starter and a main course. The prawns are also available as both a starter and a main course. I do love the concept, wish more restaurants would do it. Pan fried, they were served with cucumber, pal choi, sea lettuce, spring onion, pea shoots, ginger, micro coriander, citrus dressing, sesame and soya. 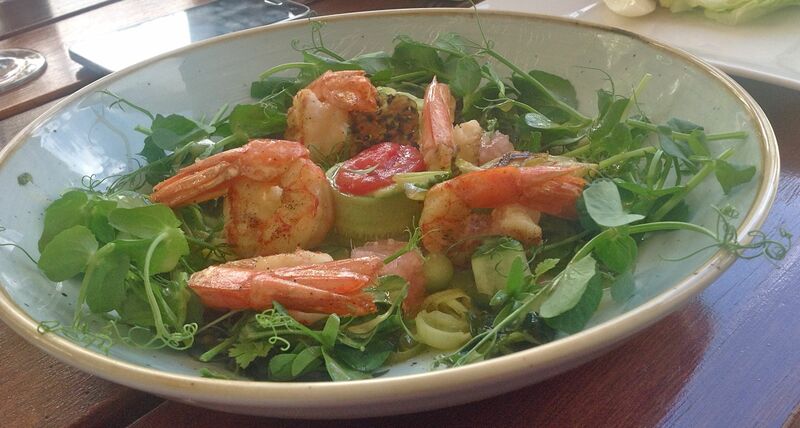 Juicy prawns nestling in a bed of green with a wonderfully zesty dressing. I love it when I read a menu and find a dish that totally intrigues me – one I can’t imagine how it’s going to look or taste – so I couldn’t resist ordering this. This is porcini ravioli consommé. 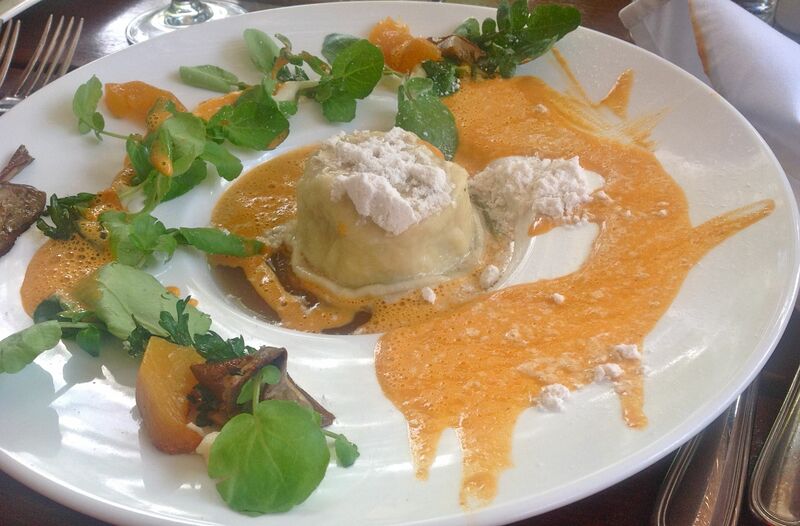 A light slightly set consommé is served with a large mushroom ravioli atop and burnt butter powder, parsnip puree and watercress peaches which are pan fried in Buitenverwachting’s dessert wine. One of the most unusual dishes I’ve had for a long time – and it was truly delicious too with a mix of flavours, temperatures and textures. An adventurous ordering choice that was well worth it. There seems to be a pork belly dish on every Cape menu and I’ve sampled my fair share of them this summer – I’m happy to say. Today’s offering was served with potato gnocchi, pan fried baby cabbage, caramelised apple, fine beans, celeriac and leek puree. 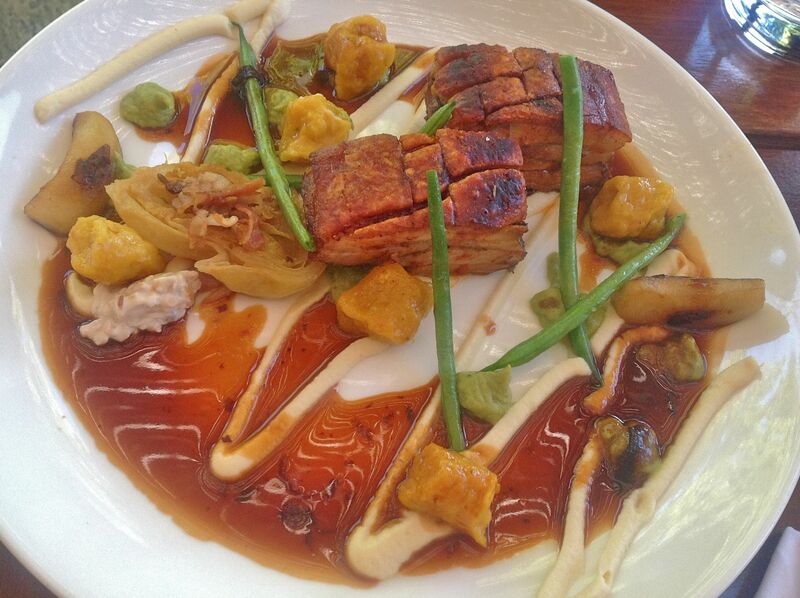 Deliciously flavoursome with crispy crackling and a wonderful combo of sweet and savoury ingredients. 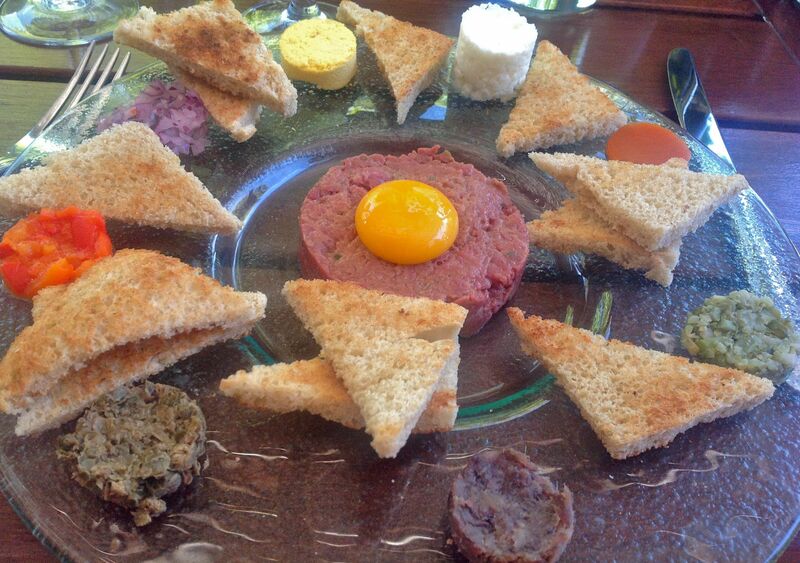 I love a good steak tartare and this is a real tartare extravaganza. Described as DIY, it comes with a selection of nine traditional garnishes all beautifully laid out in compact little bundles. Someone has taken a very long time making all these delicate delights. Some of my favourites were the hard boiled egg (separated in white and yellow parcels), the chopped capers and the rich and salty anchovies. 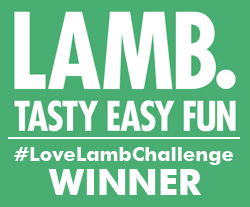 It’s a lovely ritual eating this dish as you mix and match different flavours to mix into your meaty pile in the middle. I can’t imagine I’ll ever order anything else here, that’s how much I loved it! 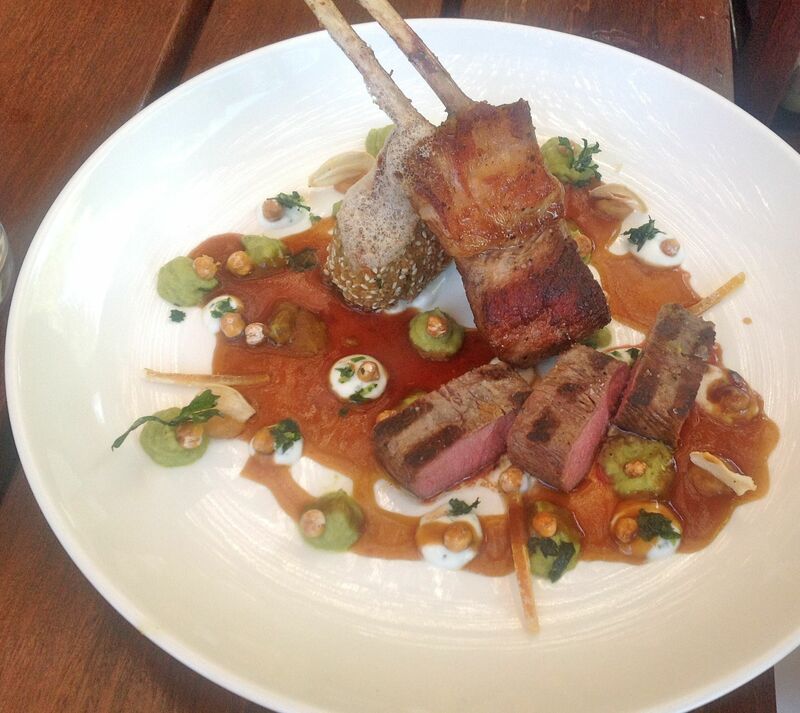 A lamb plate combo of pan fried lamb cutlet and grilled loin are with lemon thyme sauce, aubergine falafel, chorizo, leek puree, roasted chick pea gremolata and yogurt. Tender lamb perfectly done. 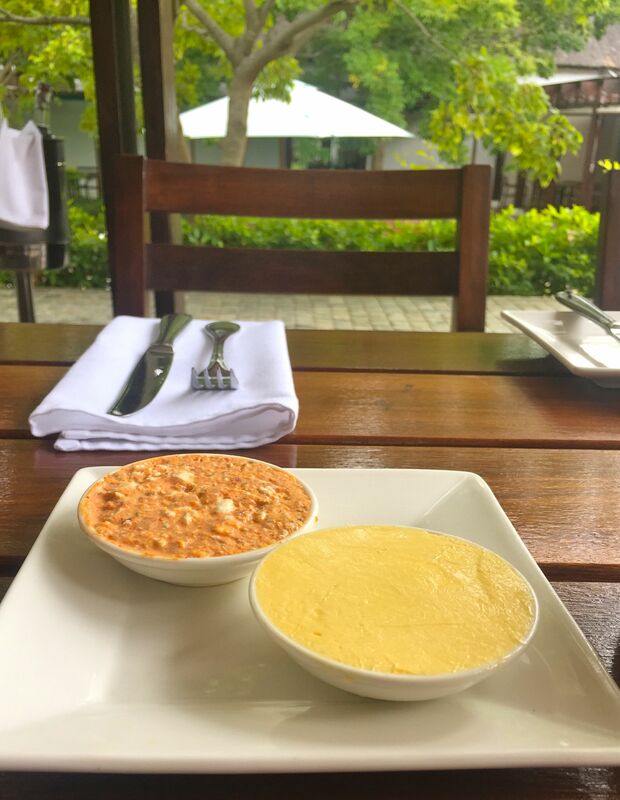 Edgar’s portions are truly substantial – two starter-sized ones make for an ample lunch. But you still have to make room for dessert when there’s my favourite on the menu. 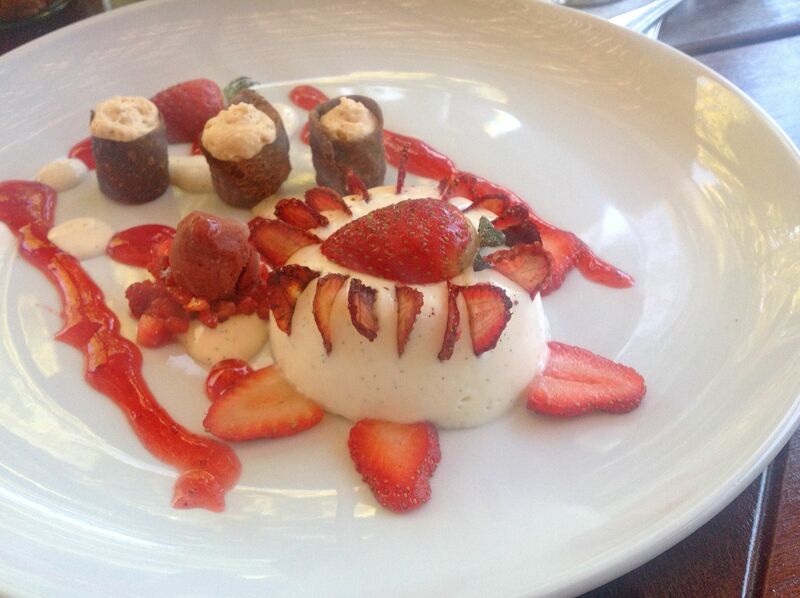 Who can resist a panda cotta? Not me. Today’s offering was a delicate vanilla served with strawberry balsamic sorbet. Just wonderful. 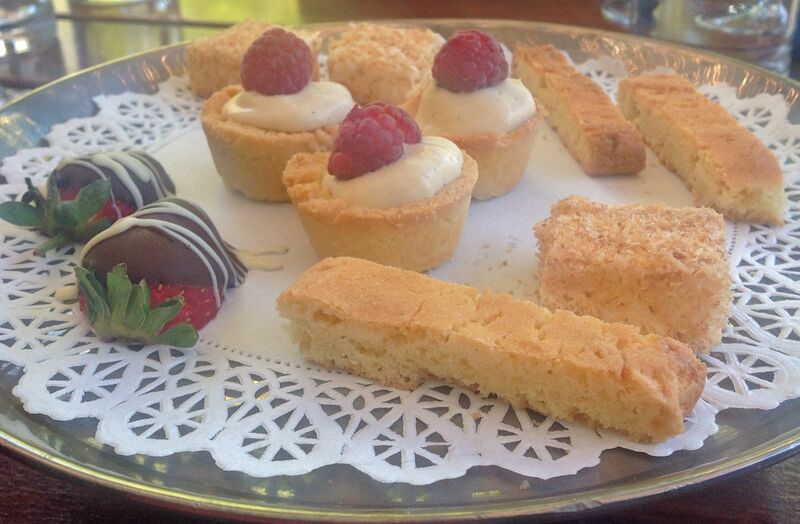 You’re not finished yet – even the petit four are substantial at Buitenverwachting. And delicious. As you’re lunching on a wine farm make sure to try some of the estate’s wine (you have to, really). The Sauvignon Blanc we had was particularly pleasing and there’s a good selection of reds. Our long, leisurely lunch sitting on the veranda was punctuated with friendly service. A really lovely experience – expectations truly exceeded. Oh and here’s the view from our table towards the leafy courtyard. Keep that spot for me, I’ll be back. Buitenverwachting is at Klein Constantia Road, Hope of Constantia, Cape Town. Love the sound of this and haven’t been for ages – will have to go back! You must definitely go back Ang. We had a really lovely lunch there and the setting is quite magical, as you know.